Last week I was fortunate to be in Savannah, where it really is spring, visiting my family. I read poetry at the independent/assisted living complex they live in, The Marshes on Skidaway Island. The Marshes has a monthly poetry group of very savvy poets who are a wonderful audience. It was the perfect place to read from Bob MacLaughlin’s FAULTY WIRING, a 2011 Moon Pie Press book including heartbreakingly wise and often funny poems about his father’s struggle with Alzheimer’s. Having the opportunity to read and talk about poetry to these folks, in their 70s, 80s and 90s, still passionate and curious, reading, writing and sharing their love of words, is a privilege. It reminds me of why poetry matters and why a love of poetry can inform a long, productive life. 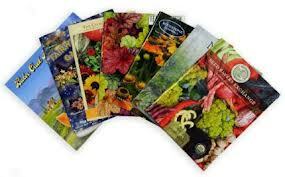 In New England, with its too-long winter seguing into mud season, with the knowledge that we can’t safely plant until Memorial Day, we gardeners have the arrival of the seed and gardening catalogs to look forward to, just about the time we get the boost from Daylight Savings Time. The White Flower Farm spring catalog is on my desk as I write this. We stare hungrily at luscious photos of flowers, shrubs, trees and perfect vegetables, knowing that we won’t do 90% of what we’re fantasizing about. The home and garden magazines show lush, artfully designed gardens in California and the South, which look enticing and alien to us. In our world we still have big piles of snirt (snow/dirt), a use for winter boots, and the groan of the furnace kicking on. This is the also the time of year in Maine when color-starved gardeners go to the local flower show, which I did last Saturday in Portland with my friend, where we saw every color of bloom imaginable, stuck our faces into fragrant lilacs, inhaled the scents of many plants, damp loam and mulch, and reveled in a foretaste of the coming green world. Yes, it’s two months away for us, but seeing previews of it helps. 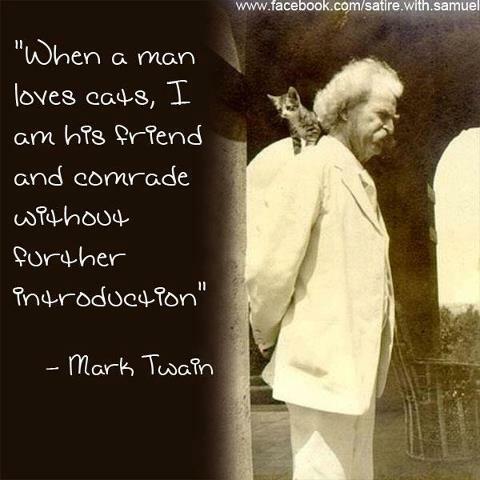 Cats are such perfect sidekicks for writers. They’re fairly quiet, they’re decorative, they sleep a lot, and they like a messy desk and a lot of scrap paper. They like to lounge on warm electronic devices. The list of distinguished writers gaga for cats (besides Clemens) includes Cocteau, Sartre, Colette, Doris Lessing, Auden, Borges, Samuel Johnson, Poe, Burroughs, Kerouac, Edward Lear, Edward Gorey, and Maine’s own Stephen King. I saw a wonderful book of photos of writers with their beloved cats. There’s also a cool book showing cats who live in bookstores, another natural pairing. In my fantasy bookstore, there is at least one resident cat.